The Ju-87 Stuka was Germany's most infamous dive-bomber. It was also one of the most advanced, featuring an automatic pull out system is case the pilot blacked out. However, the fixed landing gear and weight of the Stuka made it a very slow bird. Fighter protection was a must for the Stuka to be effective. Despite its weakness against fighters, the Stuka blazed a trail through Europe in WWII seeing active service in Europe, Russia, and Africa. The final version of the Stuka had its bomb lines removed and two 37mm cannon installed under the wings in an anti-tank role. It was a Stuka of this type, piloted by the bomber ace Ulrich Hans Rudel, that destroyed over 519 tanks during his career in the Luftwaffe. A number of Stukas were designated for Germany's first aircraft carrier, Graf Zeppelin, which featured folding wings and arresting gear. After all work was halted on the carrier, the Stukas were reconverted back to land-based operations. 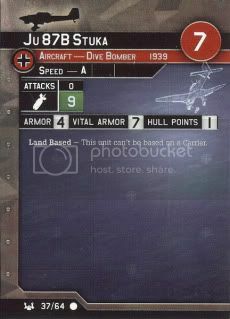 A recent errata marked the Stuka able to be based on the Graf Zeppelin and the Italian carrier Aquila. Before the Task Force set came out, the Stuka was limited to only land bases, thus limiting German players during the anti-air phase. No press the attack and armor is 4… It'd be nothing short of a miracle if you ever managed to attack with this. It is cheap, but with the investment of just one more point, you can take the Ju-87 R2 Picchiatelli, which will actually be able to push through that AA.